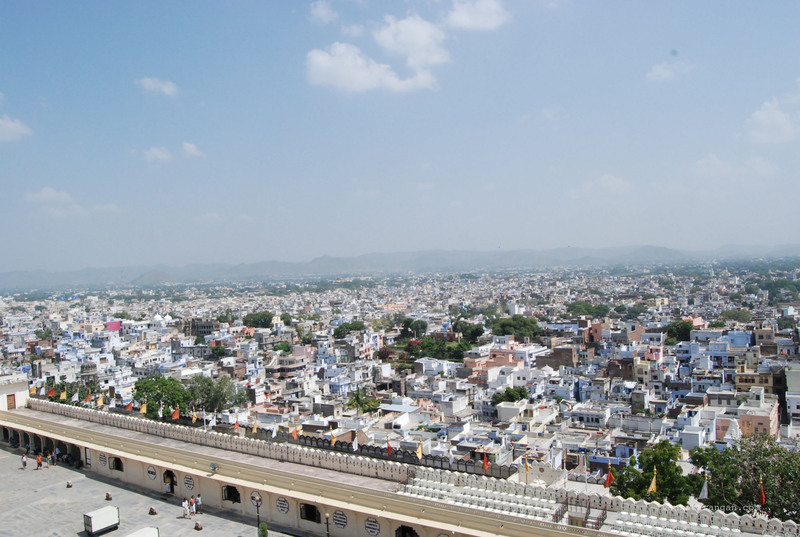 After Jaipur for last 3 days, we were in Udaipur seeing around the city. 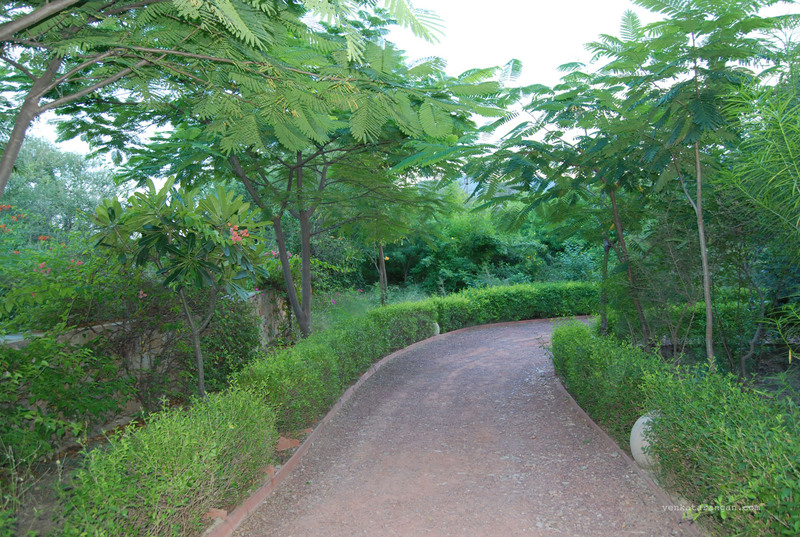 In the morning we took it easy spending our time inside our resort compound; we were staying in Trident Hotel and had access to visit the famous Oberoi Udaivillas – the super luxury resort, which was in the same compound. 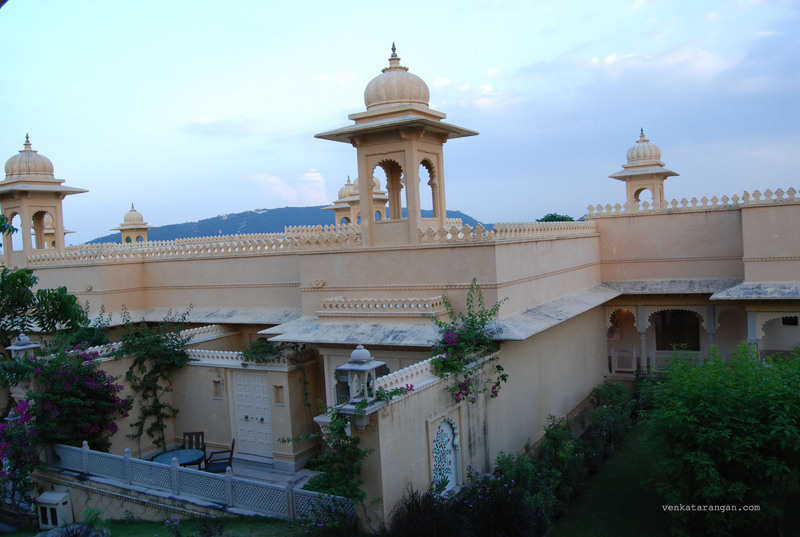 Inside the compound is Bara Mahal, built by Shri Maharana Fateh Singh Ji around 1860s by the side of Lake Pichola. 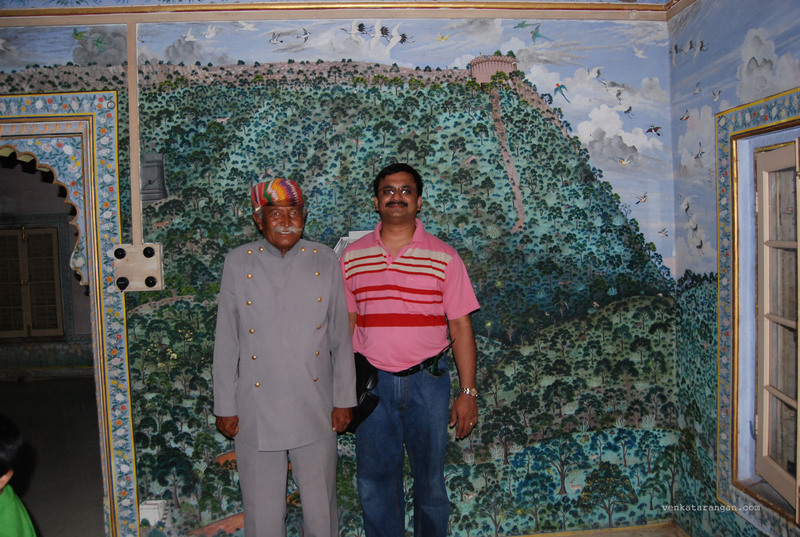 For past 36 years the Mahal is under the care of Mr.Roop Singh Ji, we were lucky to catch him in duty when we went and were able to take a picture with him. 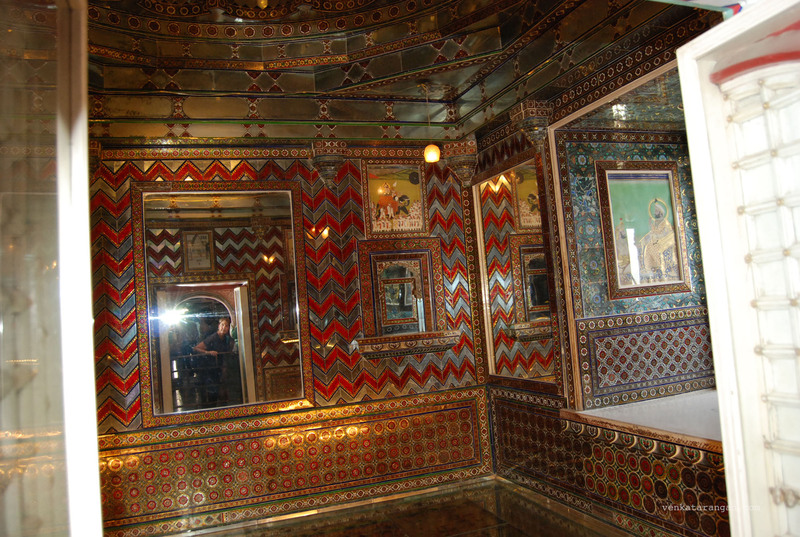 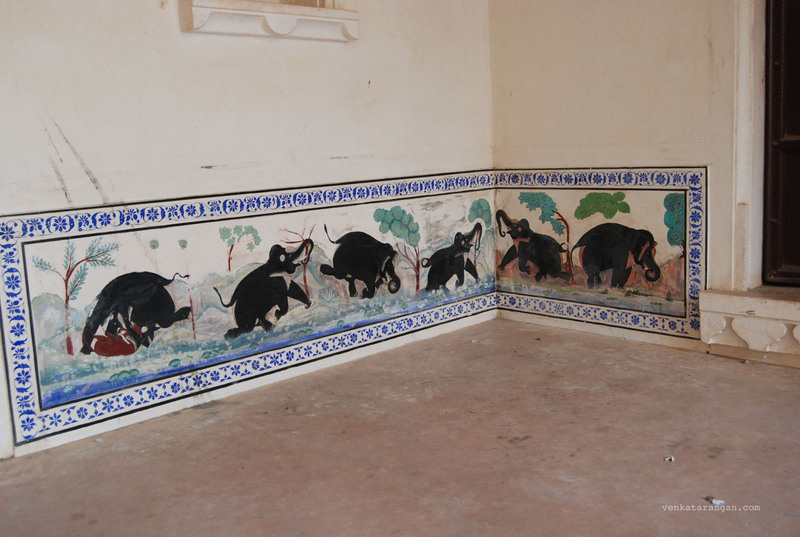 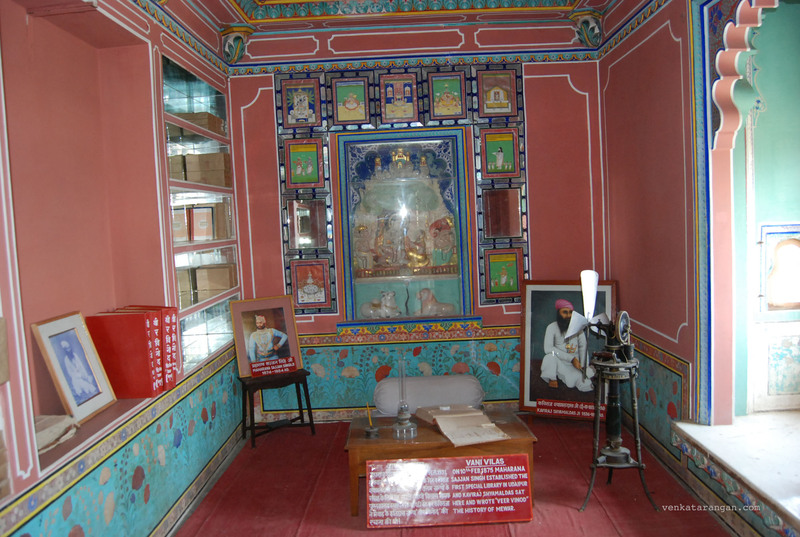 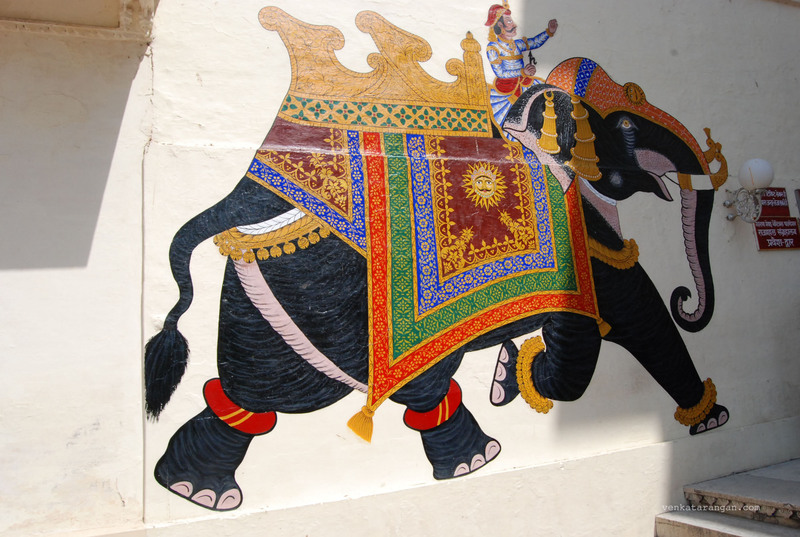 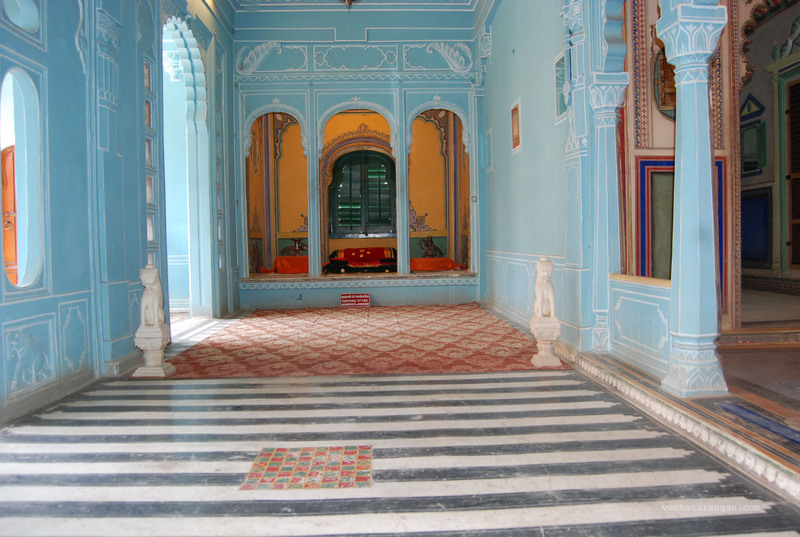 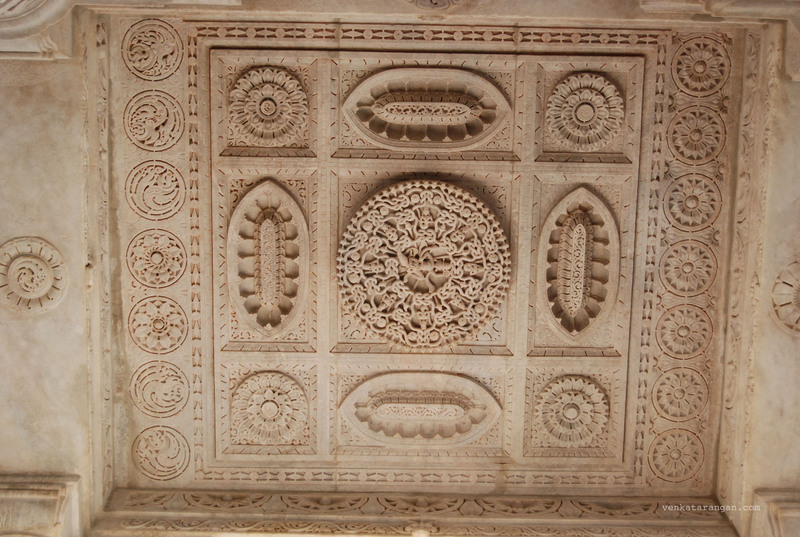 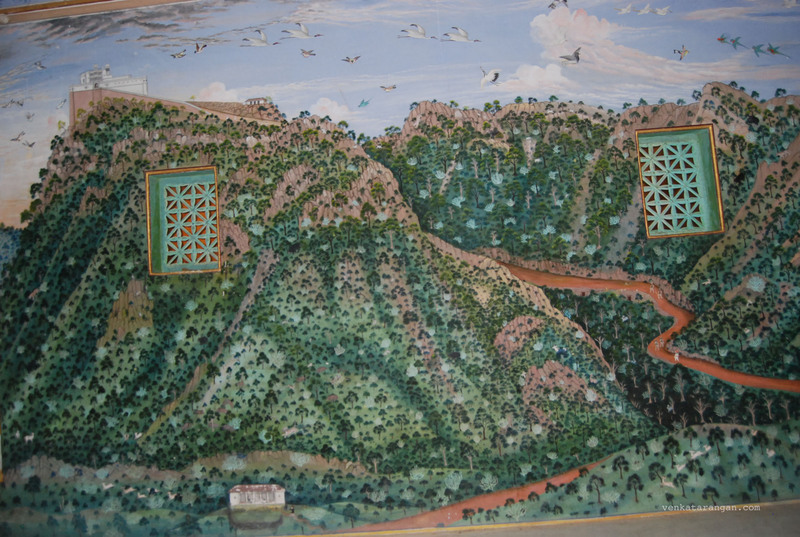 The Mahal has wall paintings showing in eloquent detail the entire Udaipur city surroundings. 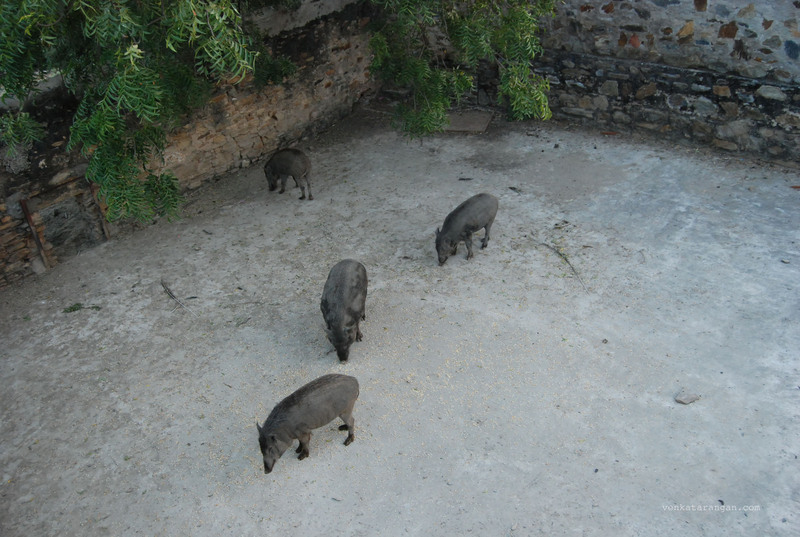 The enclosure around the Mahal is now a wildlife sanctuary with lots of peacocks, spotted deer and wild boars. 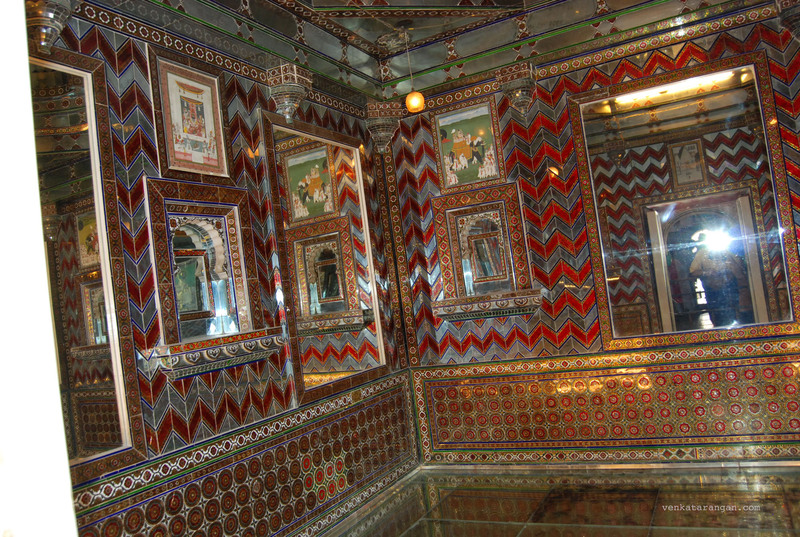 In the evening we went for dinner at Jag Mandir, you had to reserve your table here in advance. 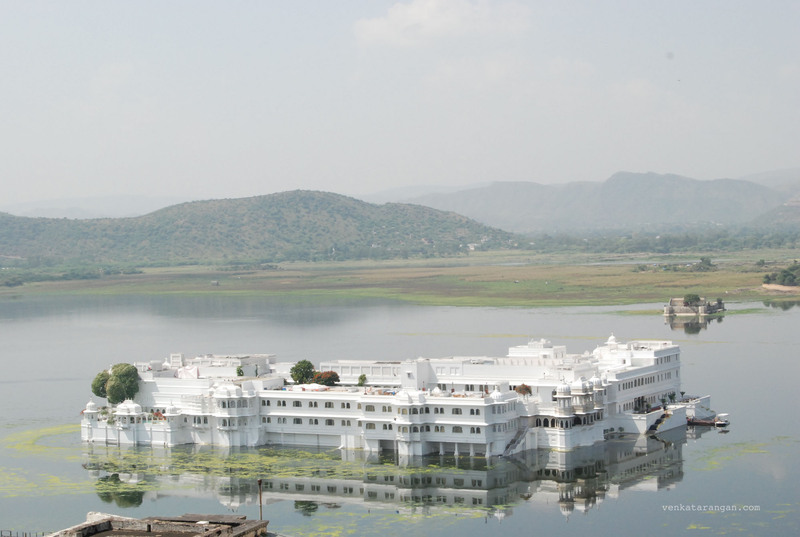 The Pichola lake surrounding Jag Mandir was properly developed and enlarged during Maharana Udai Singh II, in 1560; he had built the Jag Mandir and the Lake Palace on separate islands in the lake. 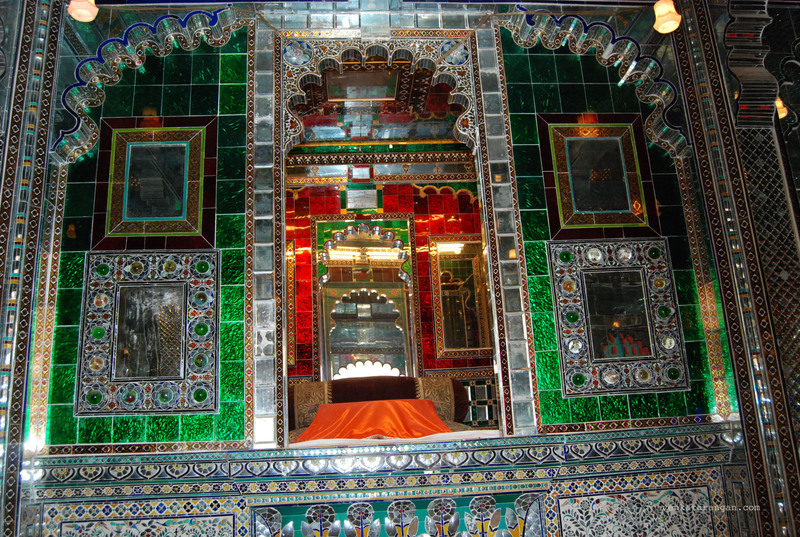 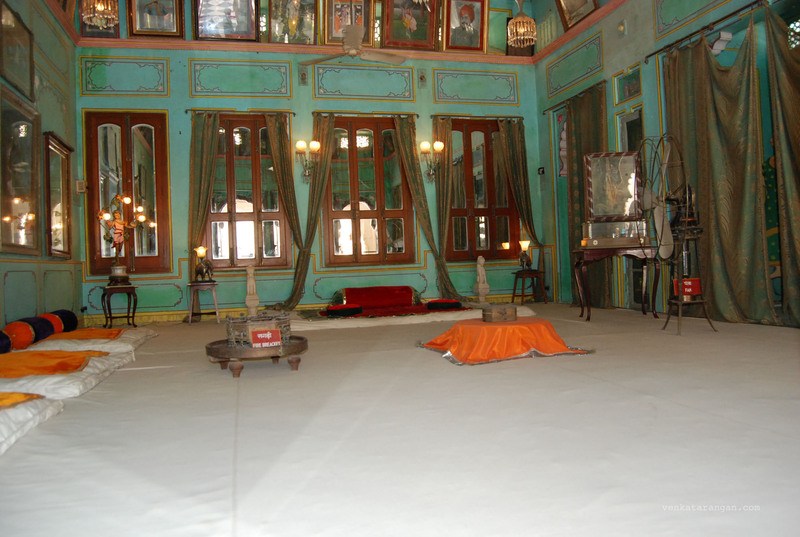 In 1623 Prince Khurram (who later became Emperor Shahjahan) took refuge here when he was living under Mewar protection after being expelled by his father Emperor Jahangir. 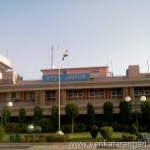 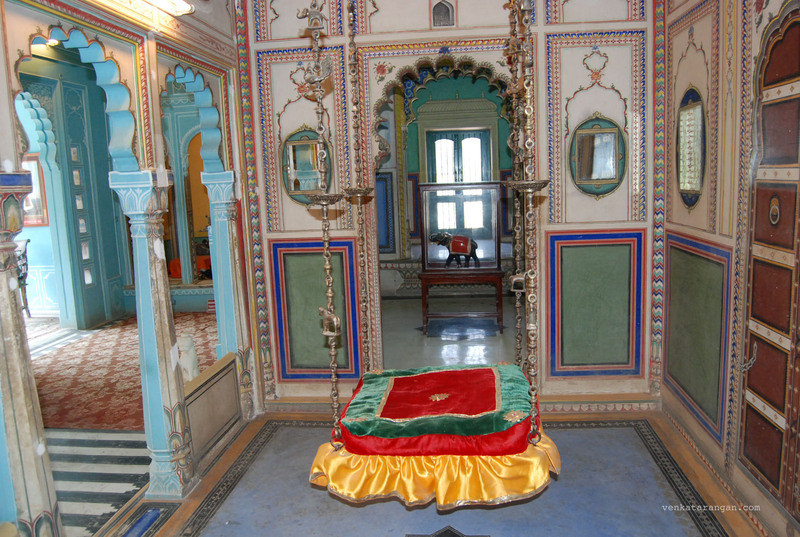 Today Jag Mandir is a luxury restaurant. 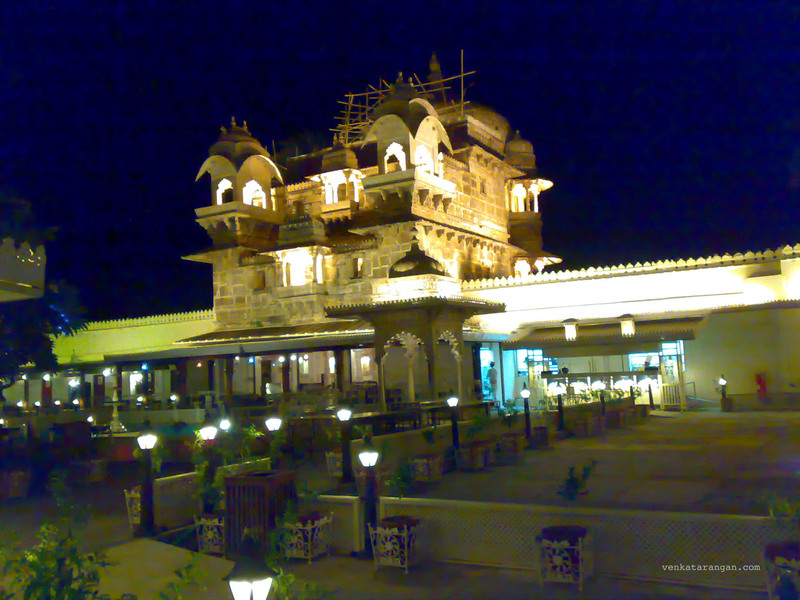 The hotel service picks you up in a speed boat from the lakeside near City Palace; as you leave City Palace you are surrounded by darkness and suddenly you see a bright shining building. 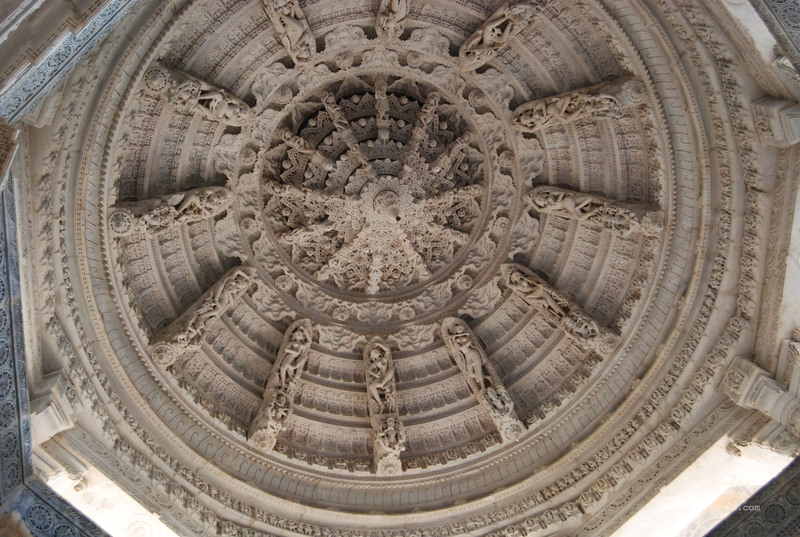 It’s a gorgeous sight to see. 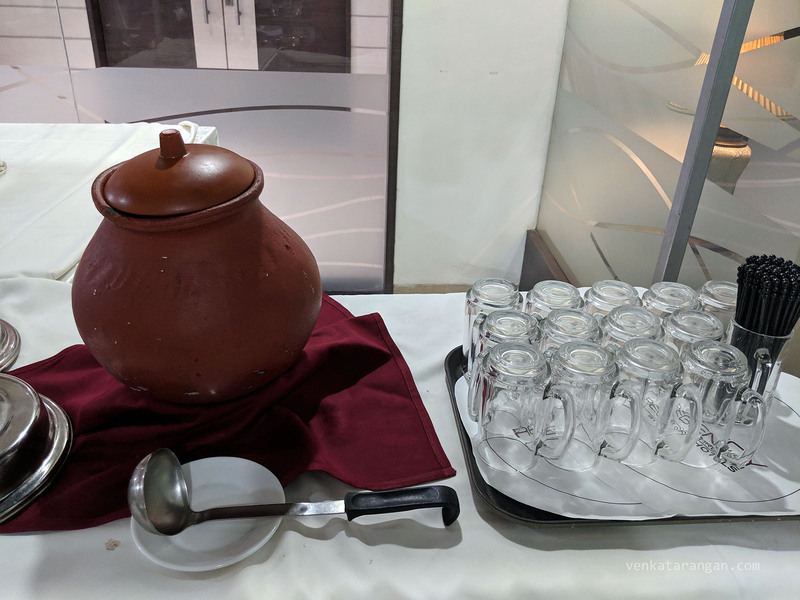 The food was scrumptious too. 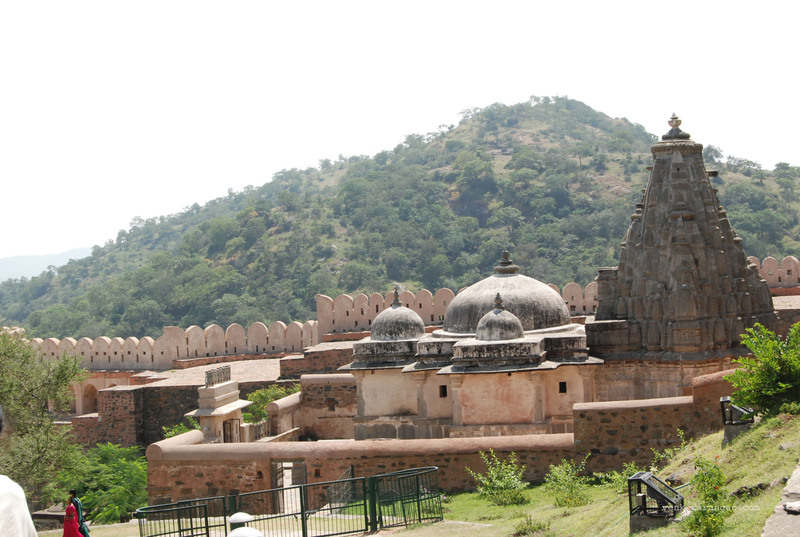 We travelled by car along with a guide from our hotel for about 2 hours reaching Kumbhalgarh Fort (Update: In 2013 the place was included as a UNESCO World Heritage site). 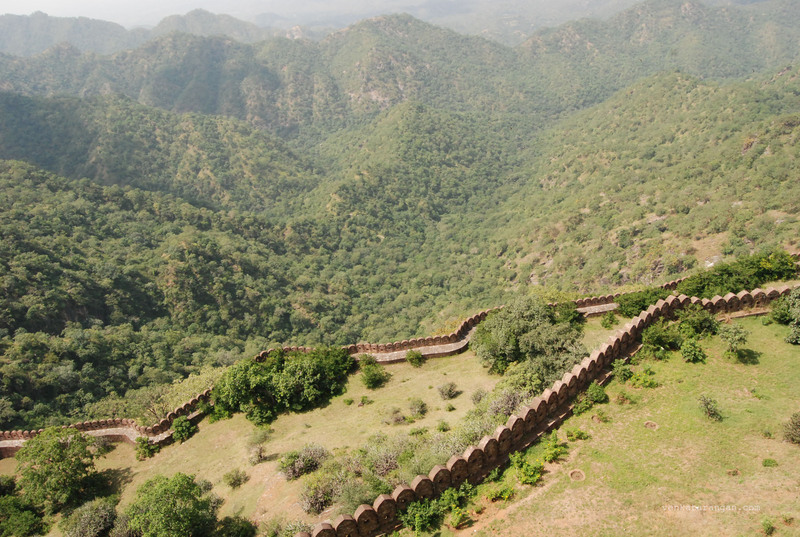 The fort goes 3,600 ft above sea level on the Aravalli range, the perimeter walls extend 36 km, making it the second longest wall in the world. 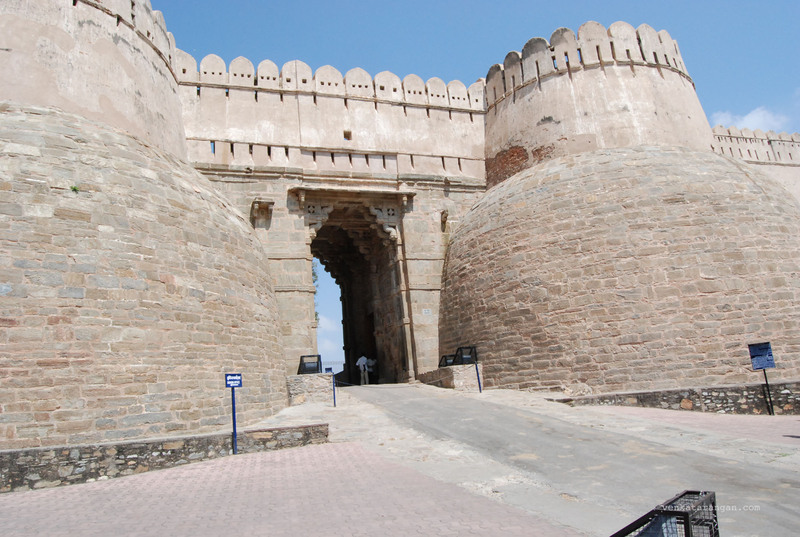 The frontal walls are fifteen feet thick. 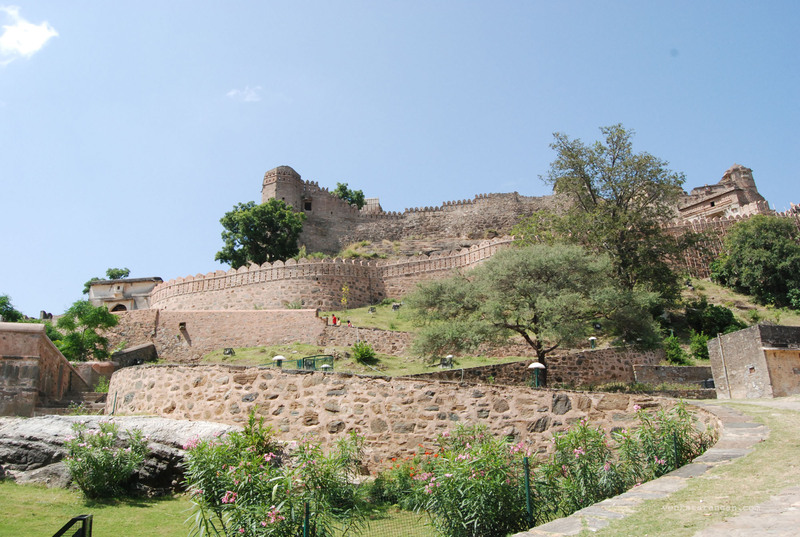 Kumbhalgarh was ruled in the 1430s by Rana Kumbha (hence the name) and here Prince Udai (founder of Udaipur) was hidden and protected in his childhood against threats to his life when the Mewar capital Chittaur was under siege. 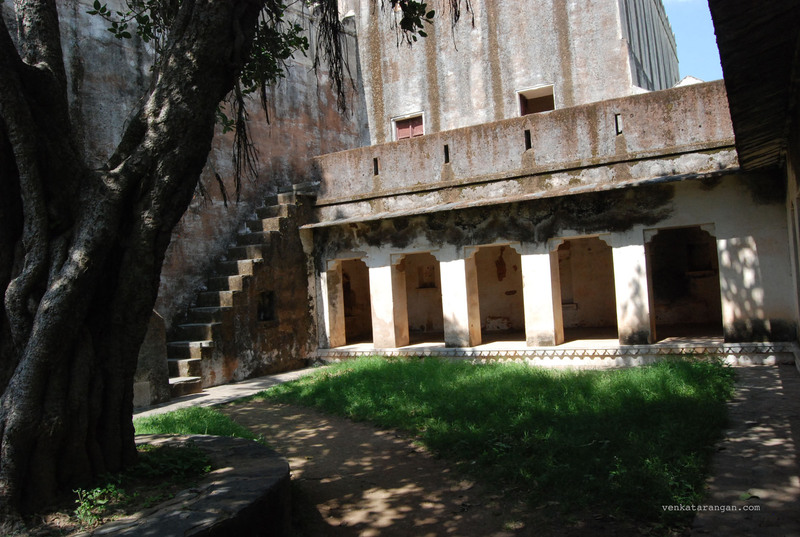 The day we went it was sunny and hot making the climb up the fort by foot tiring; takes about 20 minutes walking up. 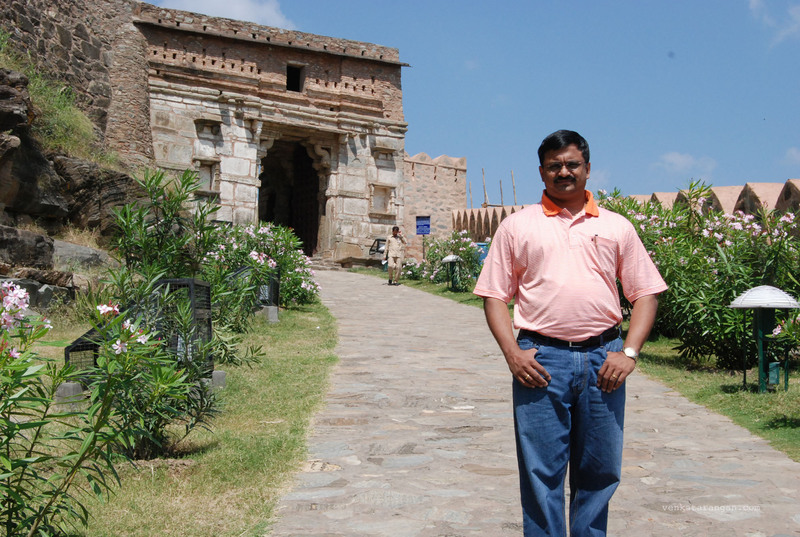 We hired a local guide for Rs.100 who spent the next 20-30 minutes showing us the various structures inside the fort including the water tank, kitchen, temples and the palace on the top. 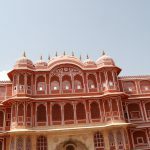 A must-see place in Rajasthan. 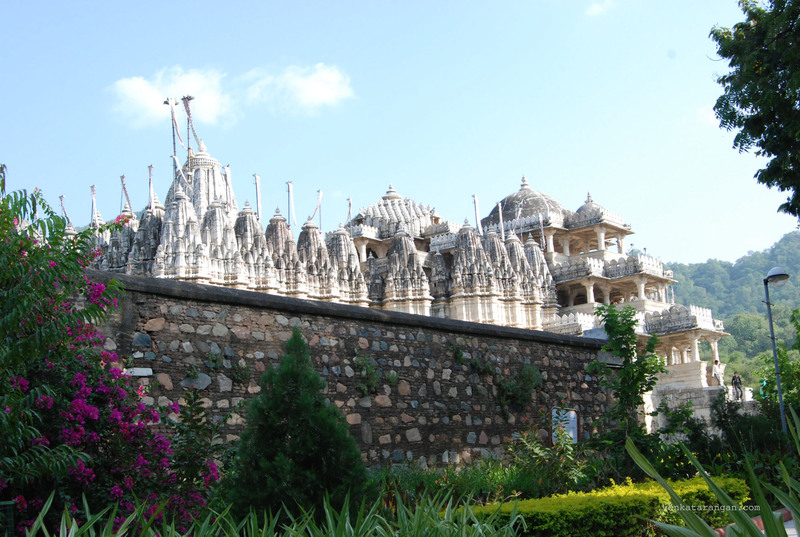 After leaving the fort a 45 minutes or so journey took us to famous magnificent Ranakpur Jain Temple. 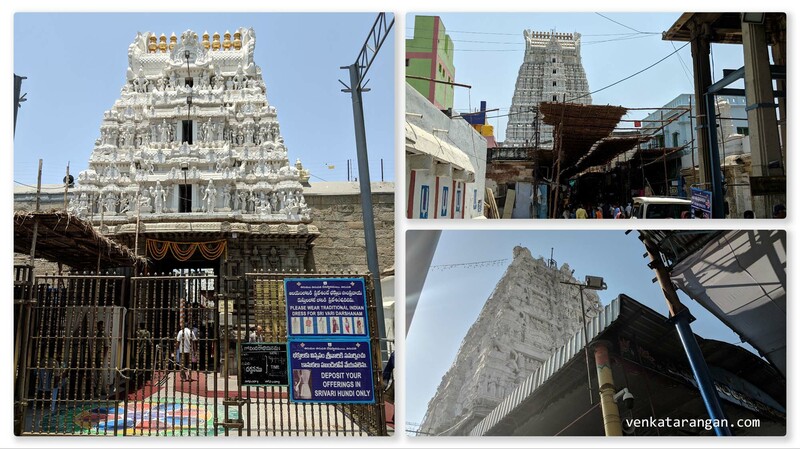 As we entered the temple and roaming around aimlessly we were lucky to spot a priest who volunteered to be our guide; he graciously spent the next 1 hour explaining in English and showing us around the temple and its specialities. 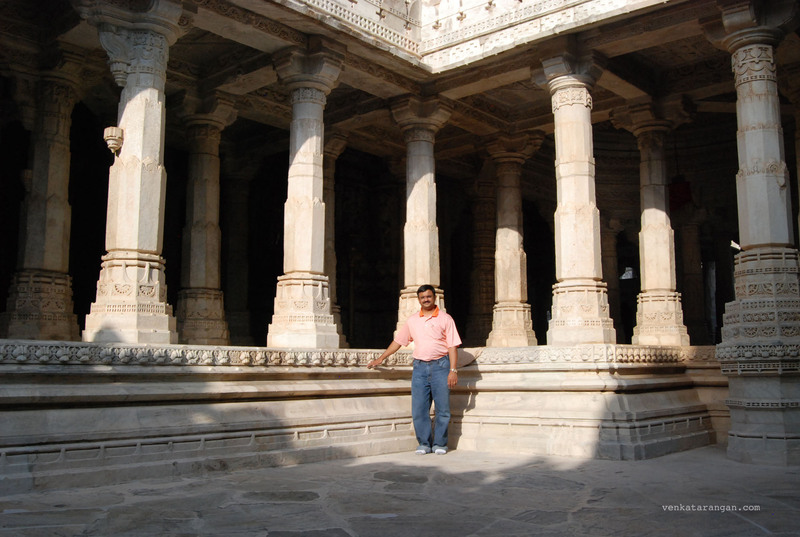 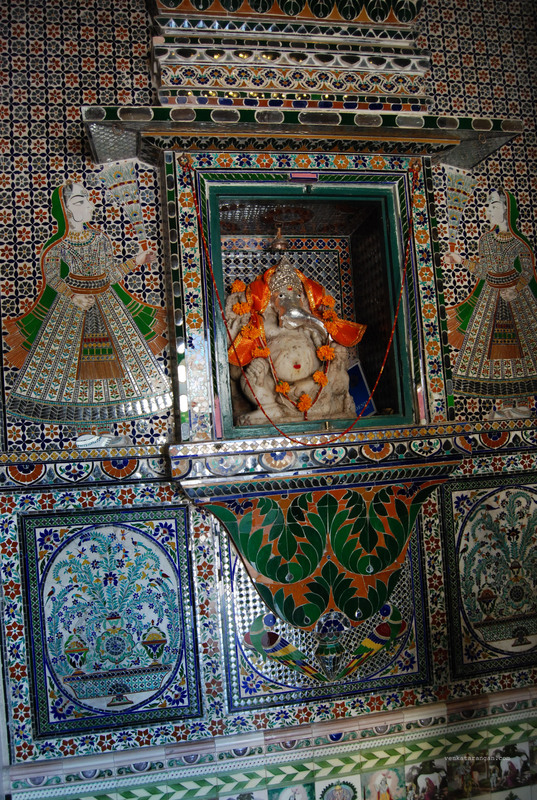 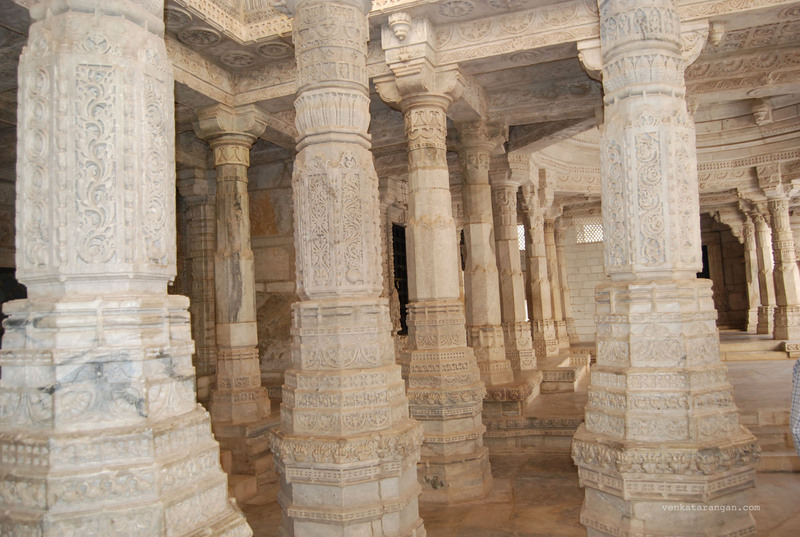 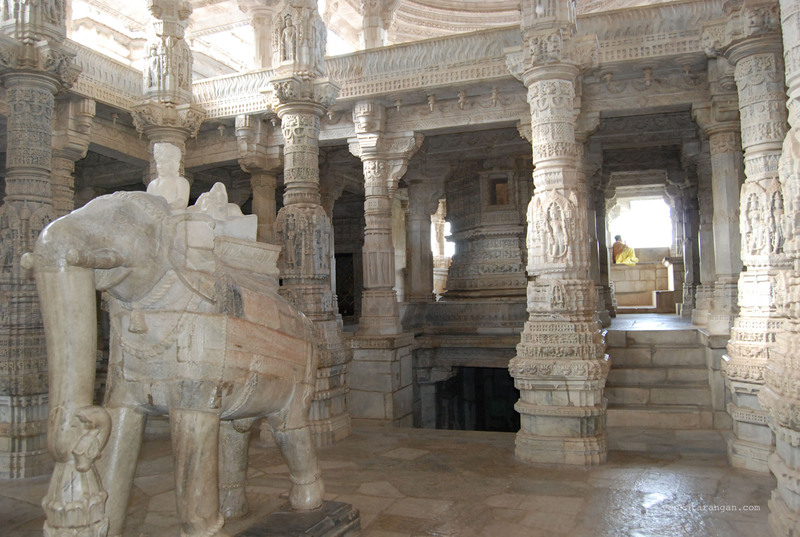 The temple has numerous marble pillars, each intricately carved. 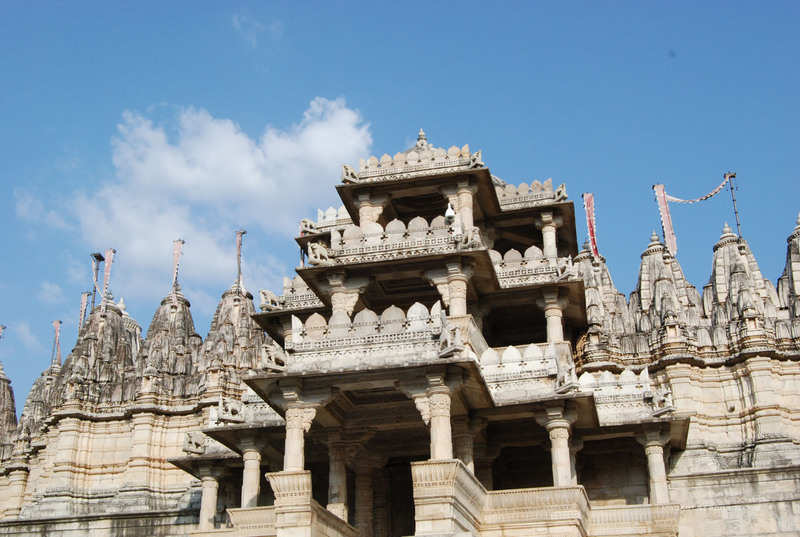 The temple was built by a local businessman/minister Sri Dharanashah with the help of (then) ruler Rana Kumbha in the 1430s. 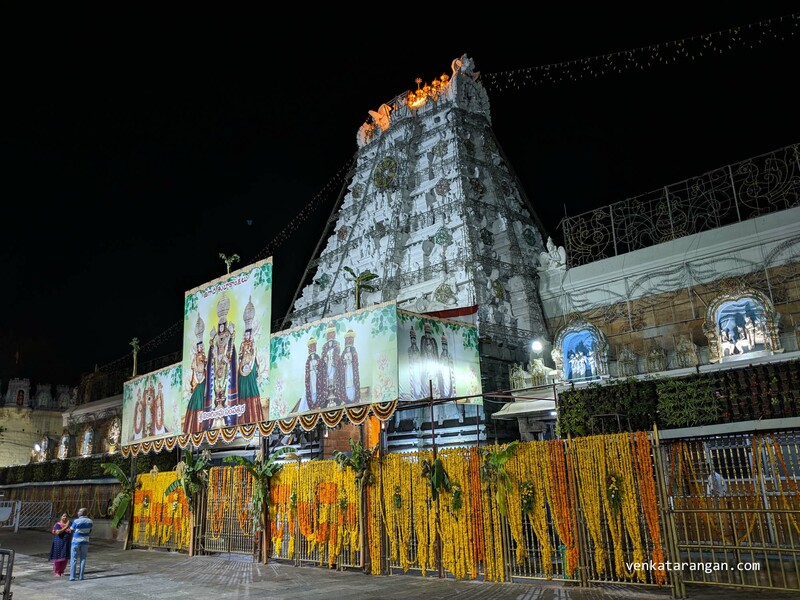 The architect Depa & his team worked for over 50 years in building this temple without a single fault but the construction was not getting completed. 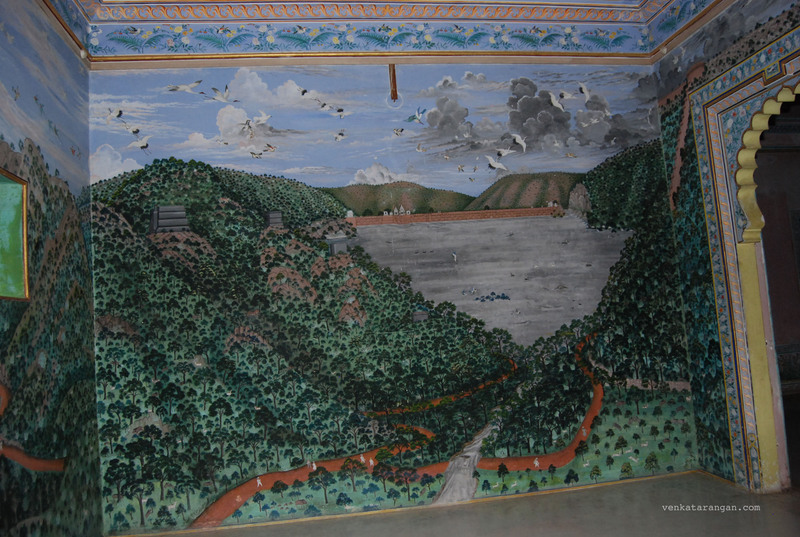 After divine intervention (in a dream?) 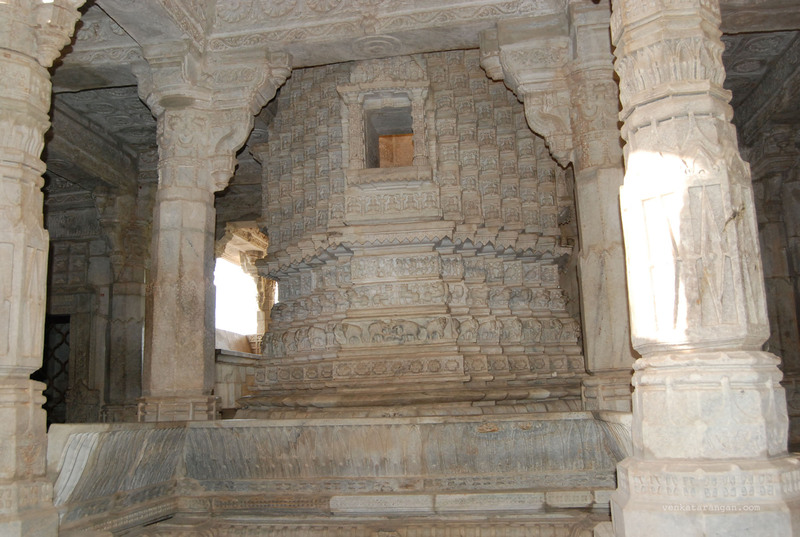 the team put in a pillar that was purposely built at an angle (seen in a picture below) creating an imperfection showing man is always flawed and it’s only God who can be flawless. 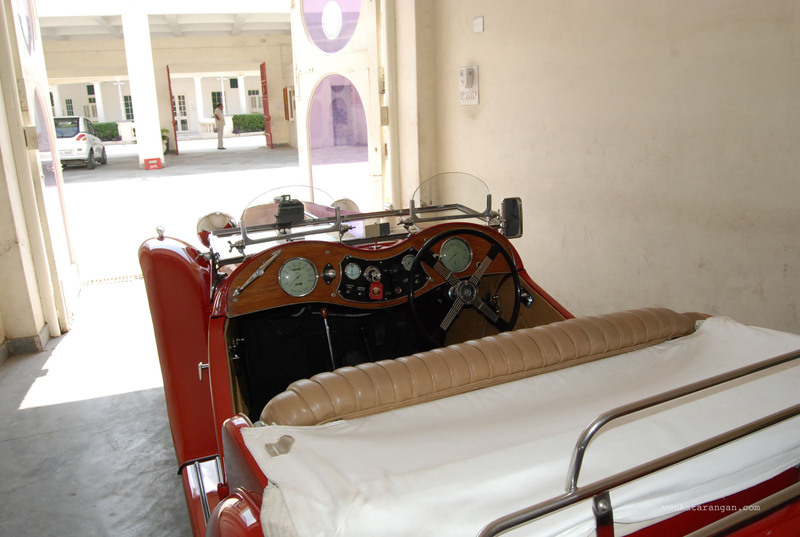 We went to see the City Palace and the Vintage Car museum. 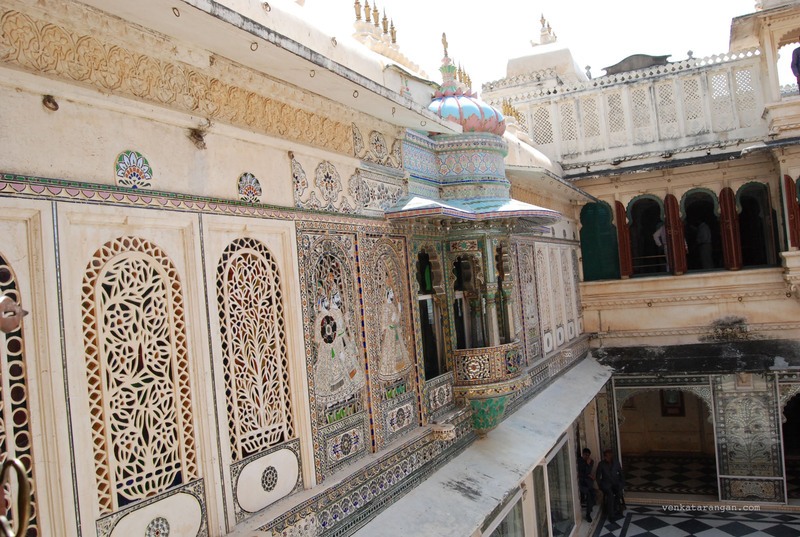 First stop was the splendour, the City Palace of Udaipur. 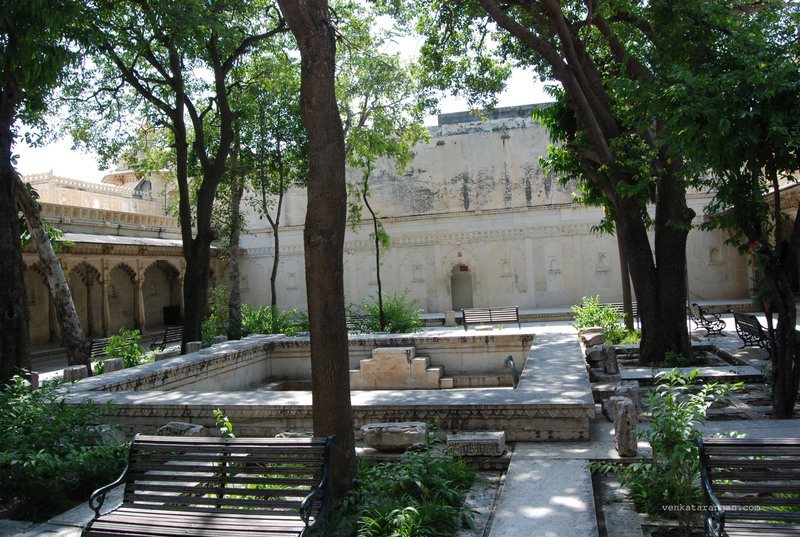 What strikes you as you enter the palace grounds is how well it’s being maintained. 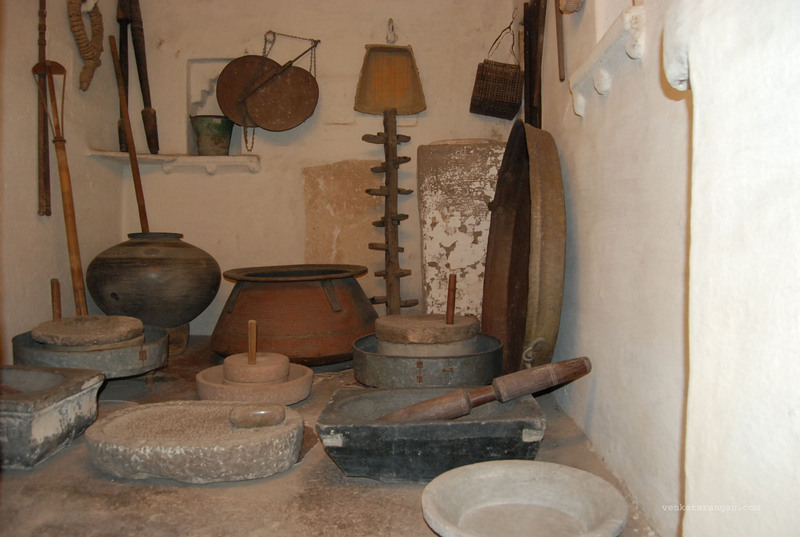 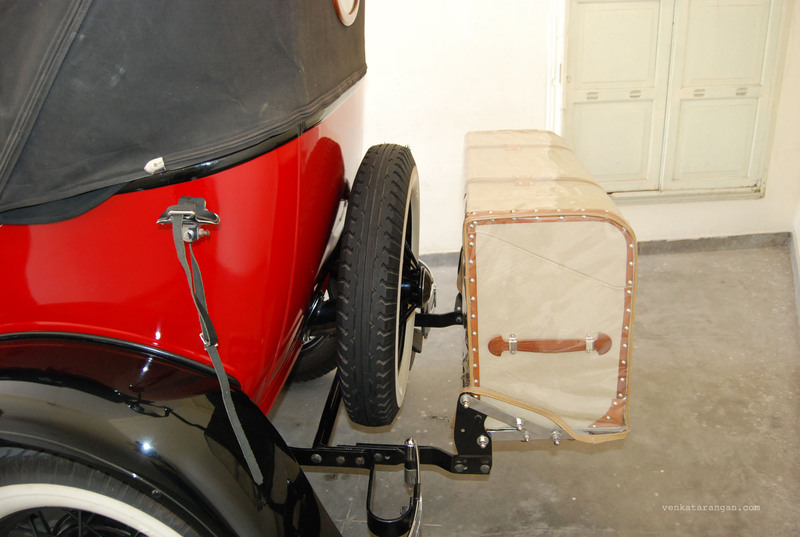 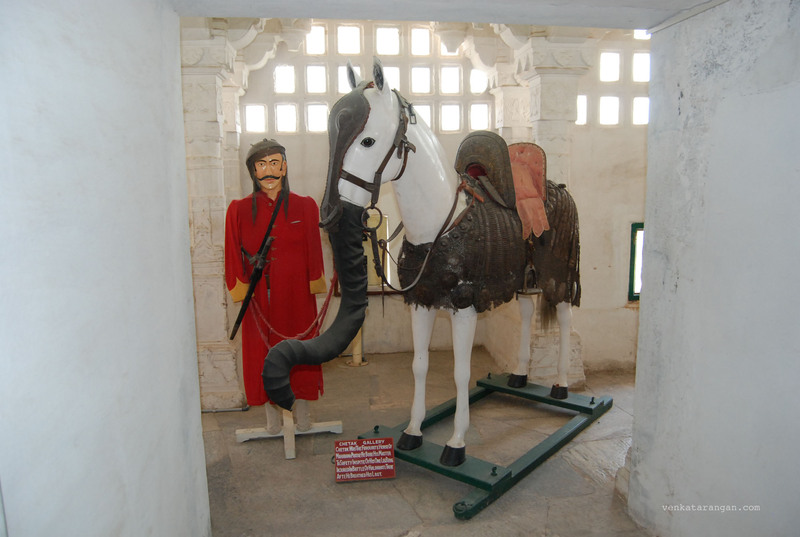 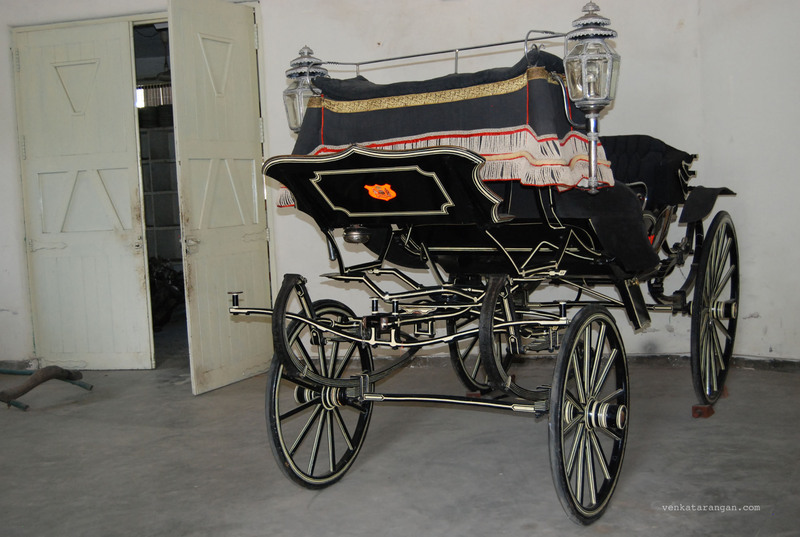 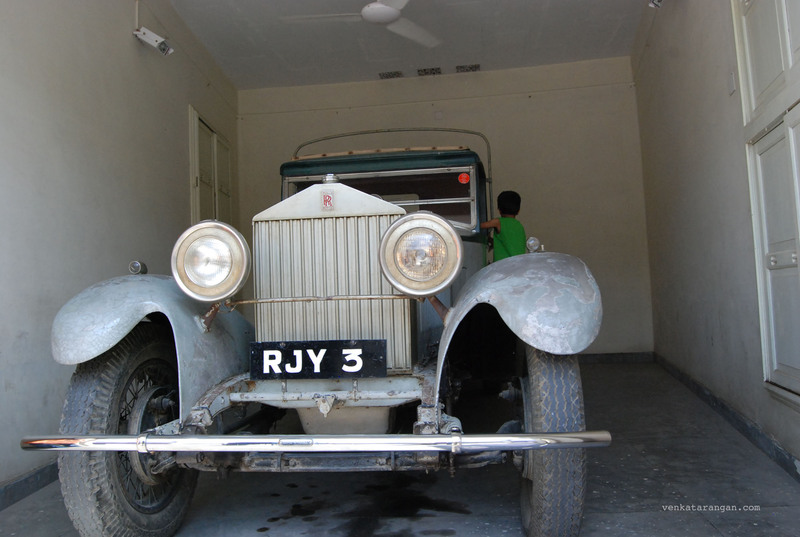 I was told a trust under the present custodian (the Rana of Mewar) manages the City Palace and Vintage Car museum. 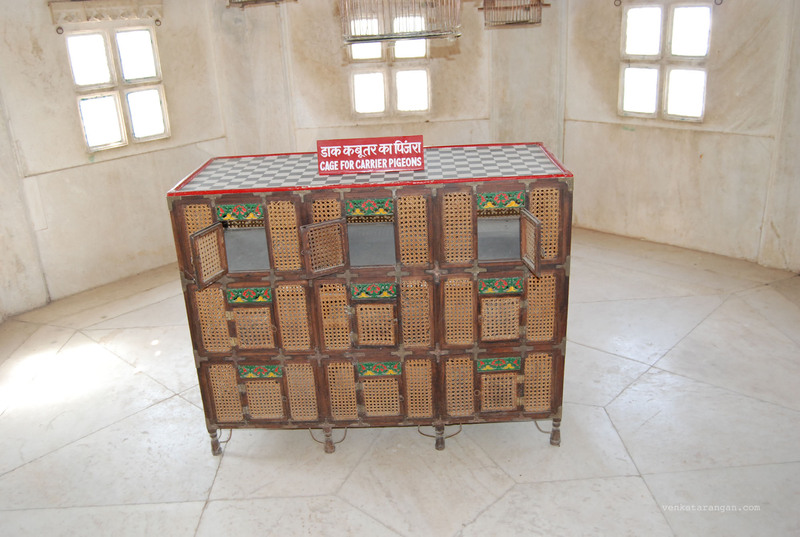 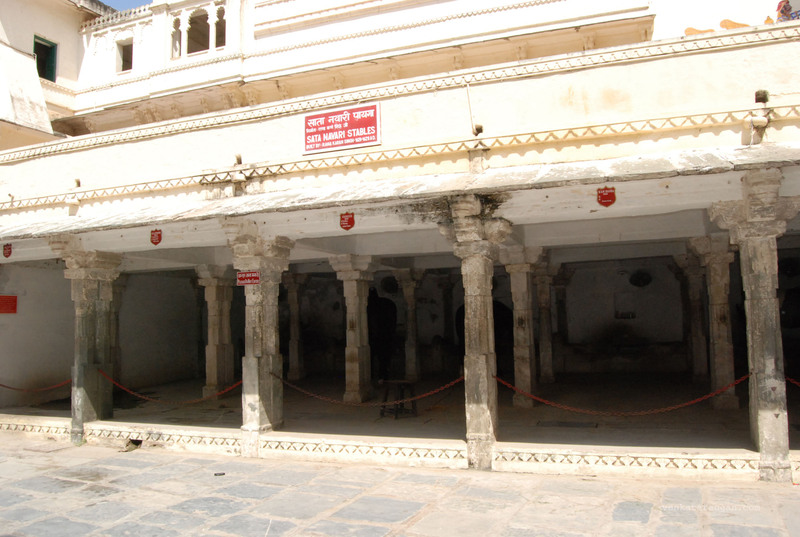 The palace was built in 1559 by the founder of Udaipur, Maharana Udai Singh II. 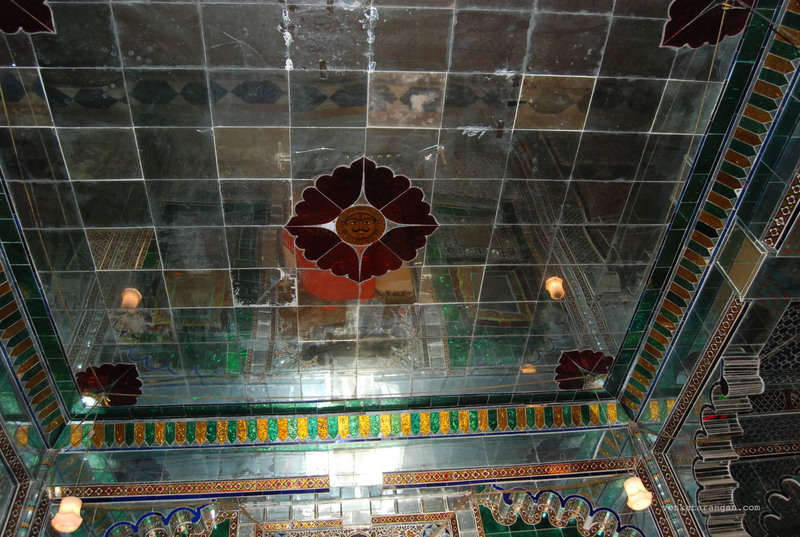 You need more than 2 to 3 hours to see the palace in detail. 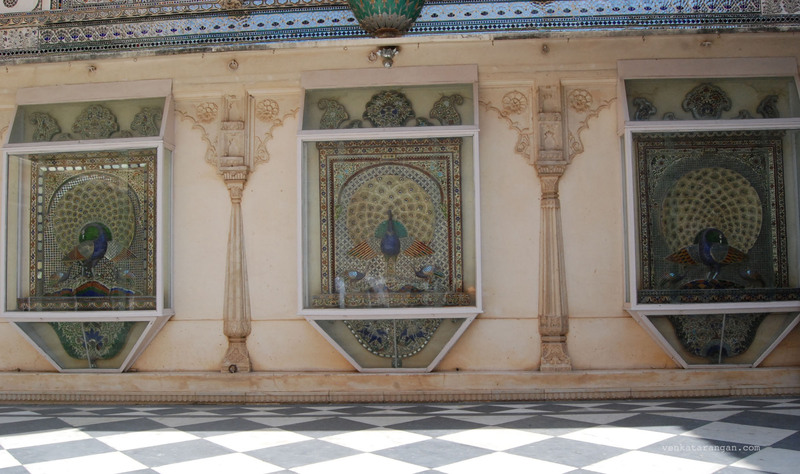 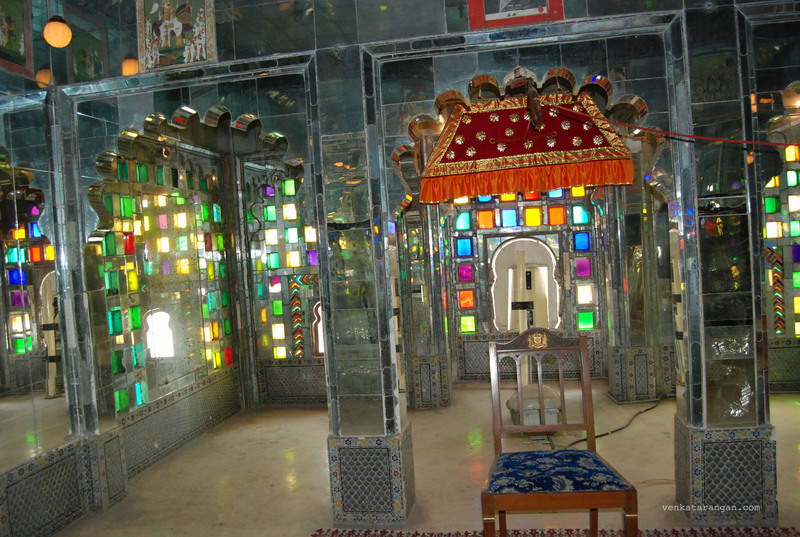 There are lots to see – Sheess Mahal or Palace of Mirrors and glasses, Mor Chowk or Peacock square, Surya or Sun emblem of the Mewar dynasty in Manak Mahal, art galleries, Durbar hall, Chini Chitrashala (Chinese art place), courtyards and gardens. 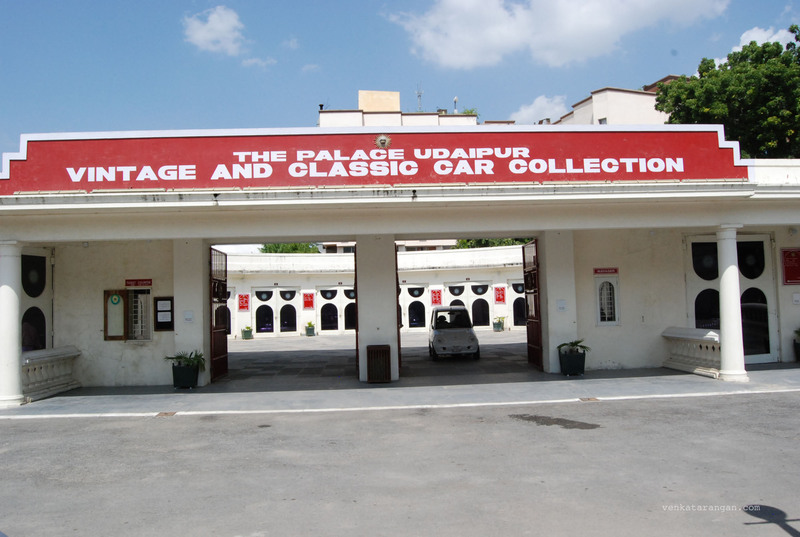 Our next stop was The Palace of Udaipur Vintage and Classic Car collection, which is an exhibit of all the cars owned by former Mewar State Motor Garage. 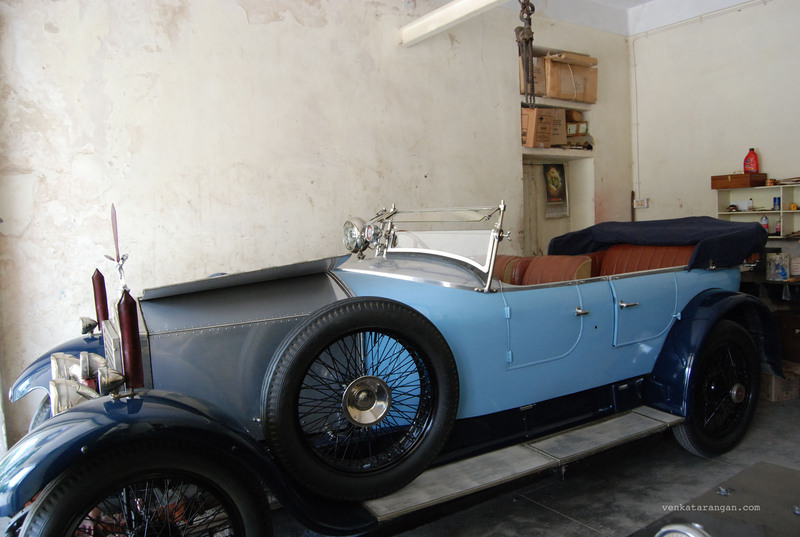 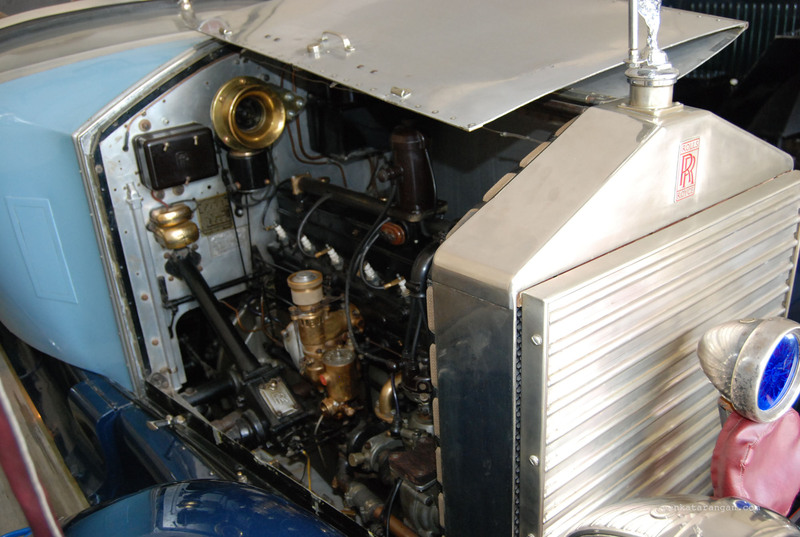 You could see many vintage cars including 1946 Buick, 1938 Cadillacs & 1934 Rolls Royce Phantom II, all maintained in top condition. 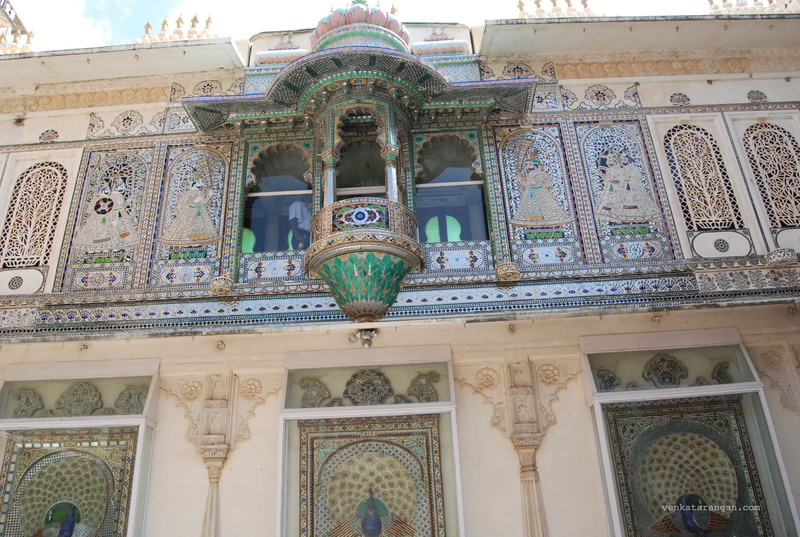 Before seeing the collections we treated ourselves to an elaborate Rajasthani lunch in the Palace restaurant inside the place; if you are visiting this place don’t miss the lunch here.